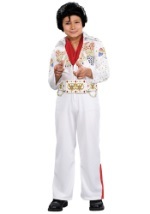 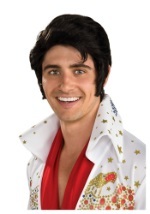 This Halloween, get the jailhouse rocking in this deluxe Elvis costume! The costume includes a foam belt that wraps around the waist with velcro. 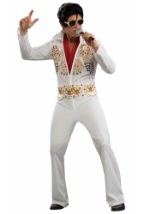 It accents the white, polyester jumpsuit that zips in the front for closure. 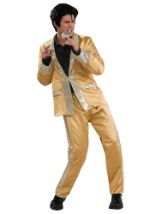 The jumpsuit has long sleeves with a stiff collar and red insets sewn into the ankles. 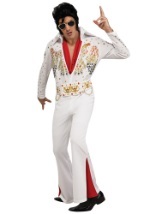 Both pieces are decorated with gold eagles and stars accented in red and blue for Elvis' signature look. 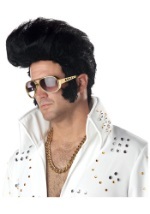 A red scarf that wraps around the neck is also included. 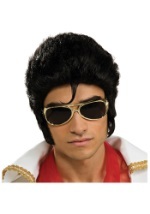 Complete your look with our Elvis accessories like a wig, microphone or glasses!